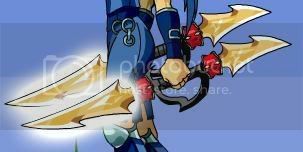 These blades seem to react to your actions. The more you try to free the trapped and tortured souls of undead the more it feels like they approve of you. This item requires a Dragon Amulet and Blacksmithing Level 18 or higher to create. -- Krazy Kakadu for alternative image-2 and old special image. -- Slayer Zach for main and new special images.